Luck of the Draw© (ISBN: 1-4392-0363-6) is the story of Lucky, one of the slowest racehorses the world has ever known. Even though Lucky gives racing his all, he never manages to win a race, and soon finds himself working as a jumper and dressage horse. No matter how hard he tries, Lucky seems to fail at all disciplines. Despite his lack of success, Lucky remains upbeat and hopeful. He is determined to find his life's purpose, and eventually learns that succeeding in life doesn't always involve winning trophies and ribbons. 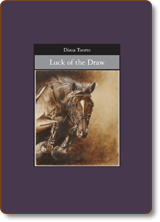 Written from Lucky's point of view, Luck of the Draw is Diana's third novel, which she began writing at age 17. Proceeds from Luck of the Draw benefit ReRun, a national non-profit rescue for Thoroughbred ex-racehorses. Cover Art by Debbie Lund. ...I'm not sure how I did it, but I flew right to the lead and held on as we passed the first turn. I could hear two horses, one on each side, start to creep up on me, but I just couldn't let them beat me. Even though Cal tightened his reins and asked me to slow down, I took off, gaining at least three lengths on the other horses. We made what would be the final turn for home and I was still leading the pack! Suddenly, Storm Cloud, the black horse, came surging up on the outside. I dug in and held on as best I could, but he overtook me. If I couldn't have first, I would at least have second, I thought, as we approached the wire. Without warning, Runaway Sable, a bright bay, charged up from the inside for second. Third, I would still have third! But despite digging in as best as I could, I tired, and a gray horse, Sullivan’s Journey, overtook me for third by a nose. I looked up and saw people sitting in the stands looking down at the track, but I didn’t see one of them looking at me. Still, Cal pulled me up and proceeded to pat me like I had just won the race. 'It's okay, Lucky!' shouted Cal. 'You did great, you've just gotta listen to me next time and not move so soon. We still beat one of those nags, right?'" To order a personalized autographed copy for $10, which includes free shipping within the US, please click the "Add To Cart" button above to pay by PayPal or credit card, or contact Diana to mail in a check/money order. Read reviews of Luck of the Draw. My Desert Sun is the story of Cayuse, a young, free-spirited mustang who lives in the desert and mountains of the American Southwest. While life in the desert is often peaceful and serene, Cayuse spends many days merely fighting for survival. However, he soon learns that survival among mankind is much more difficult.